The Great Fire of London - a terrorist attack? London's history. The Monument is located at the junction of Monument Street and Fish Street Hill, 61 metres from where the Great Fire of London started in 1666. It was built between 1671 and 1677 to commemorate the Great Fire of London and to celebrate the rebuilding of the City. How did the Great Fire of London begin? The fire is believed to have began in a baker's house in Pudding Lane on Sunday 2nd September 1666 in the early hours of the morning and finally extinguished on Wednesday 5th September, after destroying the greater part of the City. The first victim of the Great Fire of London was the maidservant to the Baker on Pudding Lane who was afraid of heights and therefore could not jump from the window. She died in the Bakery alone and is nameless. There was little loss of life, the fire brought all activity to a halt, having consumed or severely damaged thousands of houses, hundreds of streets, the City's gates, public buildings, churches and St. Paul's Cathedral. The only buildings to survive in part were those built of stone, like St. Paul's and the Guildhall. The Fire spread no further than Lincoln's Inn Field in Holborn where Channel 4's Time Team have excavated - Series 16, Episode 10. As part of the rebuilding, it was decided to erect a permanent memorial of the Great Fire near the place where it began. Sir Christopher Wren, Surveyor General to King Charles II and the architect of St. Paul's Cathedral, and his friend and colleague, Dr Robert Hooke, provided a design for a colossal Doric column in the antique tradition. They drew up plans for a column containing a cantilevered stone staircase of 311 steps leading to a viewing platform. This was surmounted by a drum and a copper urn from which flames emerged, symbolising the Great Fire. The Monument, as it came to be called, is 61 metres high (202 feet) - the exact distance between it and the site in Pudding Lane where the fire began. Learn more about the Great Fire of London, and the French Catholic who was found guilty and then promptly hanged for starting the Great Fire of London. Open Daily: 09.30 - 17.30 (last admission@ 17.00) Call: 0207 626 2717 for further details. 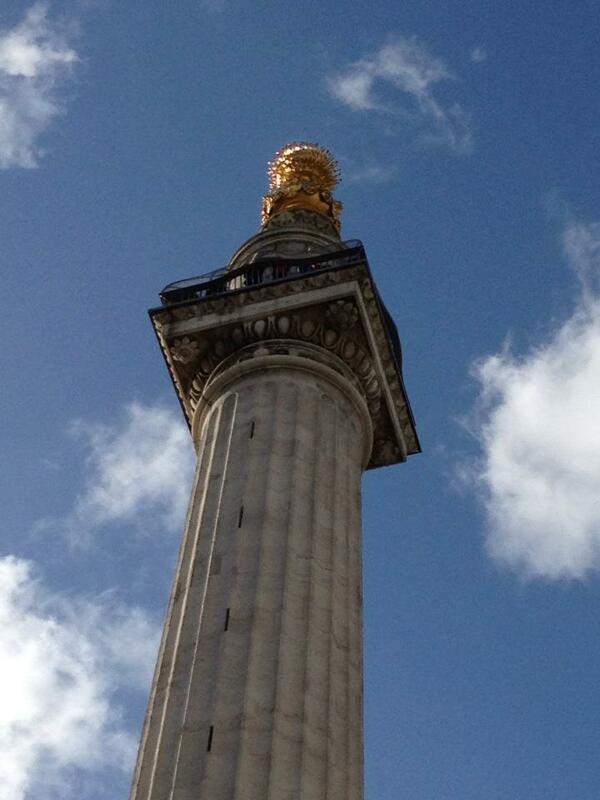 NOTE: Children of 13 years or younger must be accompanied by an Adult in order to climb the Monument.